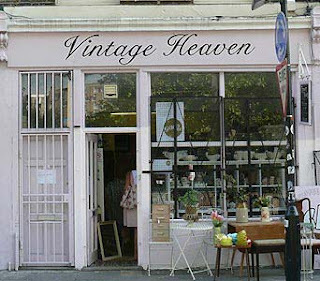 Vintage Heaven, 82 Columbia Road, Bethnal Green, London, E2 7QB. Given the amount of times I’ve wandered down Columbia Road at the weekend I was astounded that I hadn’t before happened across this quaint little, well, cake hole. Actually, I suppose it isn’t all that surprising when you consider how busy this particular corner of London gets. And combined with the fact that, to the novice eye, this address seems to be no more than a collection of vintage fabrics and kitchenware - mismatched tea sets and doilies galore – it’s probably a genuine miracle that I stumbled into this kind of cafe Narnia. 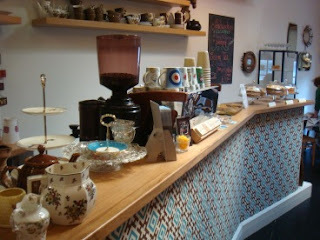 I first came across this tiny bolt hole offering coffee, cake and other tasty treats when shopping with my sister and have returned on a several occasions. The perfect, intimate venue for treating a pal to birthday afternoon tea or escaping the crowds of the Sunday flower market, I’ve always been more than satisfied with the cakes on offer and the heartily sized servings. The dimensions being small enough to create a sense of almost forced intimacy, customers must be satisfied with taking their tea almost on top of one another during busy periods. However, it is this intimacy that provokes a sense of genuine conviviality in this tiny space so often at odds with eateries on hip London high streets. I love that the tea comes in tea pots with mismatched cups and saucers and that everything – both in the shop and the cafe- is for sale. I also love that, unlike many cafes, this is almost exclusively an afternoon tea shop. There are no sandwiches or savoury dishes adorning the counter tops, but an impressive selection of sweet treats which change often so you don’t get bored. Although kitsch and cluttered, this cafe is also strikingly simple- sticking to what it does best by not trying to branch out too far from its key offerings.